The Bag Boy Revolver FX cart bag features a newly designed 14-way rotation top with full-length individual dividers for club protection; exclusive Clip-Lok technology to hold each club in place; and a Grip-Lok base that also hold the clubs in place. Other features of the Revolver FX cart bag include an integrated trunk lift handle and lift-assist handle; rubberized traction feet and Top Lok technology, a patented bag-to-cart attachment system designed to securely lock a bag onto a cart to prevent it from twisting or turning. 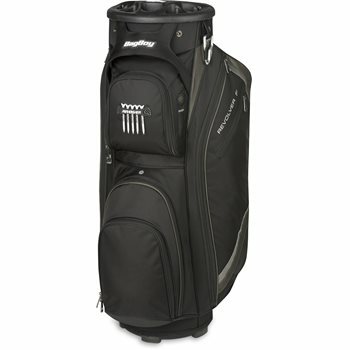 The cart bag is equipped with 7 zippered pockets, a shoulder strap holder, a cart strap sleeve, a rubberized tee holder with tees, a fully integrated umbrella sleeve, pen and divot tool holders and a matching rain hood with dual access.